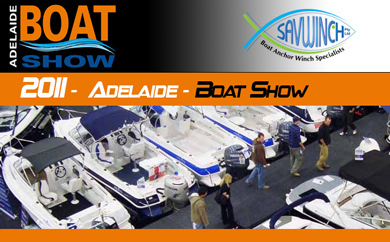 Savwinch owners Nick and Eleni attended the recent 2011 Adelaide Boat Show sharing floor space with one of their recommended dealers, JV Marine. Well established in the Boating industry owner John and his colleagues Steve and George were there, so we took this opportunity to spend time with them and learn from their experience and take their advice on board. We want to extend our thanks for their generosity in supporting us and our products. The show was Savwinch’s first attempt at hitting the South Australian market on this scale. The result was genuine interest in Savwinch products and the positive feedback we received about our boat drum anchor winches in comparison to the wider market. Thank you to those customers that purchased a Savwinch at the Adelaide show. We know you’ll enjoy having this all Australian made drum anchor winch on your boats as you fish the South Australian waters. If you didn’t pick one up at the show and are still chasing a boat anchor winch in South Australia, make sure you check out our new suppliers in the area (See the ‘Where to Buy’ page on our website).